Talented teenager Dylan Kennett showed a glimpse of his outstanding ability as the omnium competition got underway on the third day of the UCI Oceania Track Cycling Championships at Invercargill this morning. Kennett, 18, from Waimate, topped times in the men’s 200m flying lap, the first of the six-discipline events at the SIT Zero Fees Velodrome. His time of 12.894 secs was his second time under the 13 second barrier in three days, only achieved in an omnium by Olympic champion Ed Clancy (GBR). He headed Kiwi compatriots Shane Archbold, who was fifth in the London Olympics, and Cameron Karwowski. World champion Aaron Gate lived up to his reputation to lap the field twice to take out the 30km Points Race. Olympic omnium bronze medallist Annette Edmondson (AUS) leads the women’s competition after winning both the flying lap (14.184s) and the points race from New Zealand’s Jaime Nielsen, second in both disciplines, and teammate Lauren Ellis third. Tonight the omnium riders will contest the elimination race with the final three events tomorrow. Olympic medallist Simon van Velthooven is safely through to tonight’s semifinals of the keirin after comfortably winning his heat. All the major players are through to tonight’s semifinal, although 2011 world champion Shane Perkins (AUS) withdrew with illness. The competition, one of five continental championships that now carry qualifying points for next year’s world championships and also ranking points for the 2016 Rio Olympics, finishes tomorrow night. 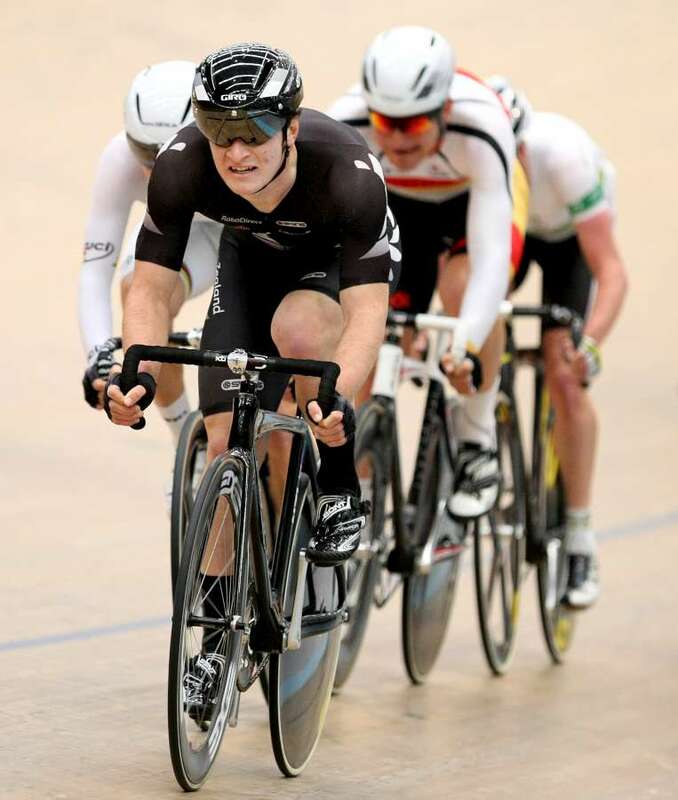 CAPTION: Dylan Kennett in action at the Oceania Track Cycling Championships.